The industrious students of the New York Harbor School have an innovative answer to how we can protect the city from the next Hurricane Sandy – oysters. The school, which is on Governor’s Island, has been growing oysters over the last few years as a way to restore living reefs in New York City’s harbor. Now the youngsters have also begun advocating oysters as a way to protect the region from dangerous storm surges like the ones that recently battered our city. 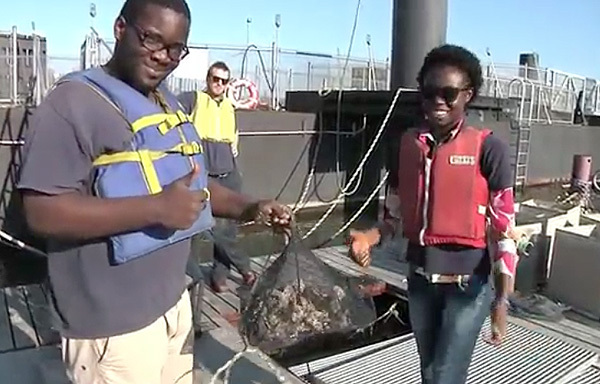 According to the Harbor School kids, oysters aren’t just a popular happy hour delicacy in New York, but also a natural way to help filter pollution out of the Hudson and East River harbors. The students at New York Harbor School have a unique relationship with these waters since they not only take a boat to school, but also focus on studying boat building, environmental science and history. They also grow around 500,000 oysters beneath a dock near the school on Governor’s Island as part of an aquaculture class. The kids learn about the natural filtration that oysters can provide, but have also released a study pushing for more storm surge prevention involving the mollusks. Rather than building storm barriers, the students suggest creating a soft shoreline of organisms that once thrived in the waters – including an oyster reef. Aside from acting as a natural and living storm surge protector, the oyster reef would also provide a home for small marine animals, as well as naturally filter nitrogen from the water. According to the kids, bringing an oyster reef back to the New York area can help protect the area from rising tides, future storms, and pollution.